Did you know that 80% of marketers report email as the strongest performing media channel? A well-excuted email campaign could help you generate more leads, increase the customers’ loyalty, and grow sales. Even if you are not any eCommerce merchant but a blogger, you could use the emails to communicate with your audience and make money online from there. However, the question is, how to grow an email list? The pattern of building the subscription list is pretty much simple: you attract traffic to your site, then you ask them to sign up. The first step can be much easier if you reach people through advertisements. However, if you are just starting out your site with a limited budget, you could use blogs to collect emails for free. Content is important in your long-term marketing strategy. Yes, the journey of content hardly takes less than six months to see some results. Indeed, you would have to pay much time and effort to create truly valuable resources that reflect the demands of customers. The best thing is blogging is totally free if you have great skill of writing. Plus it is the most effective tool to help you get found by highly engaged customers. Have a regular blog release schedule and work on the SEO to improve the ranking of your page, soon enough you will notice a steady amount of traffic pouring to your site. More traffic also means more subscribers. And as people find your content helpful to their needs, they are likely to sign up your email list. However, the most important thing is always the quality of your content. How do you create insightful blogs? There is no shortcut. You have to spend time researching the need of your audience. Take a look at frequently asked questions on social communities, create a survey to interview customers, or do research on keywords. Google still remains the most popular platform people access to seek for an answer. Hence if you find high-volume keywords in your niche, write about it. Google Keyword Planner is a free tool to research keywords. You could ask people to subscribe to get weekly or monthly updates of your blogs. However, it mostly works for those who are highly interested in your content already. Many people just access a blog for some information, then bounce off immediately after they get what they need. As the bounce rate of a normal website is 58.18%, more than half of your traffic is likely to leave without a trace. In this case, you should use a smarter trick to motivate visitors to sign up. What is better than content? It is premium content: eBooks, checklists, cheat sheets, infographics or whatever your audience might be interested in. You must have seen this type of content on various blogging sites as people asked for your email to unlock some resources. It works, as long as the offers are tempting enough. This is an example from Minimalist Baker. 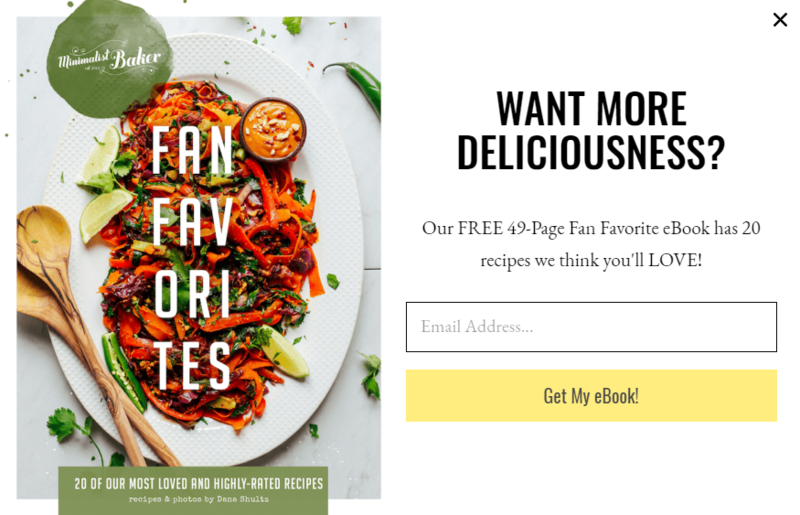 Instead of popping up a subscription box asking people to opt-in, they offer an interesting 49-page recipe eBook. They understand that their audience is into cooking, and they trigger their curiosity with the fan-favorite-recipe bait. The offer is tempting in both the context and design. If you could work on high-quality content like that, for sure you can grow your email list fast. When you have your insightful resource ready, you can start promoting it to your audience. Popup is a good way to catch your site visitors’ attention. You can use popups to drive people to your landing page or convert them immediately with a quick sign-up form. However, some people find popups pretty much annoying. It can be true if you aggressively show popups without cautions. Use too large popups that hide the majority of your site away: Especially those whole-screen popups. This way, you will get more annoyance than attention. Show the popups on the first page as soon as viewers land on your site: Visitors know hardly anything about you yet, so why would they sign up to your list anyway? How about things should definitely do to optimize your lead-capture tool? “If content is king, then context is god”, said Gary Vaynerchuk. You should spend time implementing your writing for sure. But instead of filling your content with promotional terms, concentrate on the messages instead. 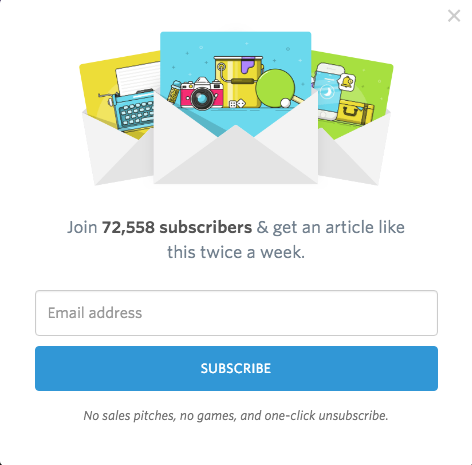 This popup shows up at their blog page to encourage visitors to sign up for more articles. It is much on-point with a simple design. Visitors know exactly what they get by signing up: an article twice a week, no sales pitches, no games, and one-click unsubscribe. Moreover, to strengthen their message, they mention the email list of 72,558 subscribers as social proof. You could do the same to your email form and customize it to fit your strategy. It does not mean that you should stay with simple message and design. You could make the form just as beautiful and creative as the rest of your site. Just remember to always be clear about your value propositions. Time is the key to improving the users’ experience. As mentioned above, immediately showing popup is not a smart tactic for first-time viewers. You should let the visitors explore your site content for a while before inviting them to take any action. The delay time depends on your site also. It could be just 5 or 10 seconds if the targeted page is short with little texts or information. In case you want to convert subscribers through a long blog, let viewers read your 80% of your post then. But the ultimate time for conversion is right when users are about to leave your site. We call it the exist-intent moment. Whenever users hover their mouses to the browser tab or exit button, a popup appears and wins them back. The exit-intent popup can convert 25% of your leaving visitors, which make it a powerful tool to build the email lists for any website owners. 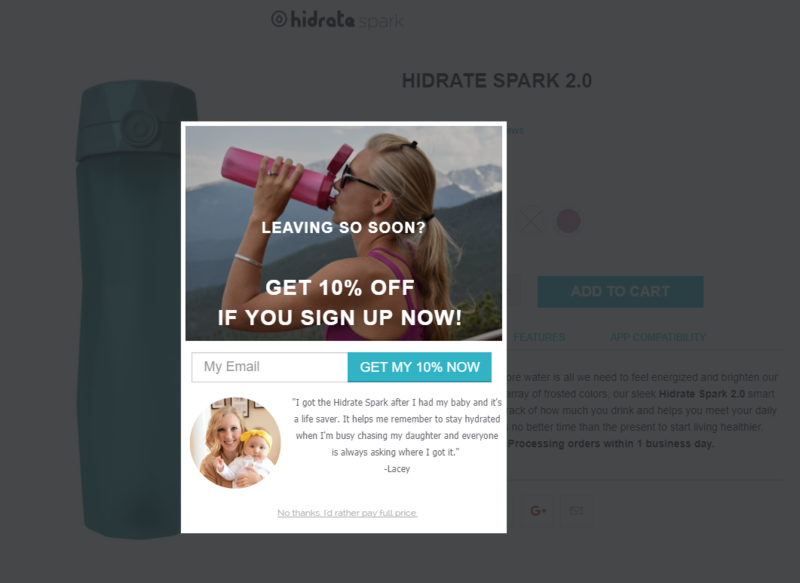 Hidrate Spark offers 10% discount for abandoning visitors as they are about to leave the site. The popup even includes a short testimonial to strengthen the trust of their targeted customers. Such popup can be created with tools like SiteKit’s Popup. To maximize your chance to convert subscribers and customers, you should expose your offers to the audience as much as possible. It does not mean you should fill the pages with dozens of popups, it is annoying! Instead of using only modal popups, you could go with header bar type also! 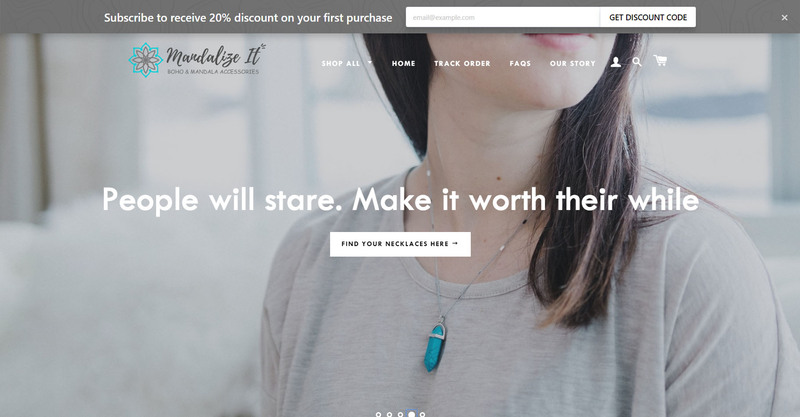 Mandalize it use the header bar with a coupon code to motivate customers to sign up. The promotional bar like this is highly visible as it stays sticky on the page when visitors scroll down. They are still able to read your site without problems, just like when you are reading this blog with our header bar on top. The best thing is you could show more than one offer on the site, or give visitors a stronger impression of your proposals. But whatever types your popups are, make sure they are relevant to the pages they appear on. The logic is pretty simple. If you show a premium offer to people who are already engaged with your page or blog content, they are more likely to take action! If possible, you should create several popup offers for different audience personas. Divide your traffic into segments, and make premium content for each. It takes much time and resources, but for sure your effort will pay off with more qualified leads. When you have powerful lead-capture materials with insightful resources and converting popups. You should concentrate on driving more traffic to your site. The traffic problem could be easily solved with advertising like Google ads or Facebook ads. However, if you are small in budget, the best way is to contribute to the community. There are tons of communities you could find to reach the potential subscribers or customers. For example, if you are a blogger in eCommerce, you could find various groups about online business on Facebook and LinkedIn like Ecom Empires, which has 72,000 members. If you manage to engage like 1% of them, you already get 7,200 visitors! You can also join eCommerce forums, or subscribe to some Reddit subs. There are dozens of opportunities for you! Just keep in mind that don’t try to be too promotional. People will ignore you as you do with other advertising posts. Think of what you can do to help others, like sharing your experiences, expressing your thought about a specific issue, or revealing some surprising facts about your niche. 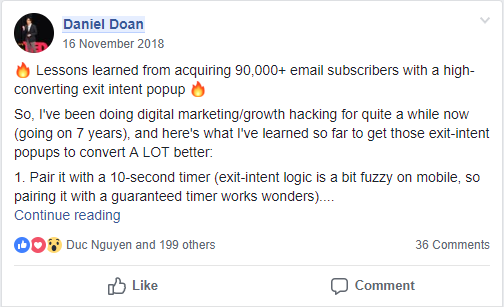 Daniel Doan shared his experiences with exit-intent popups to Badass Marketers & Founders group. He said nothing promotional, just a list of 16 valuable tips in creating popups that convert. The post got high engagement with 200 likes and 36 comments. Another way to get traffic and high-quality link building is guest blogging. You can do quick research on the top blogs in your niche, then find out if they are accepting guest blogs. If a blog is open for guest bloggers, then you should find pages like “Write a blog for us” or “Guest blog guideline” where they guide you on how to pitch your posts and contact them. In case you are interested in a blog with high engagement, but they are not accepting guest blogs, then you can write an email to pitch your writing instead. Love your site. Noticed your write a lot about [subject]. I recently wrote a post for [another site] that generated [number] page views. It was their top post this year. You should have a 50% success chance, but it is much worthy. The shortcut to get traffic and grow your email list is through advertisement. However, if you are starting out with a small budget, then blogging is your answer. Building a blog takes lots of time and effort, and you will not see the results immediately. Stay patient and consistent. When you understand your audience’s needs and provide just exactly what they are looking for, you soon will notice a leap in your subscription list.